World renowned self-help mogul Tony Robbins firewalk challenge is responsible for injuring 21 people during his Unleash The Power Within Event this week. Organizers had an “open burn permit” and medical staff at the event, and there was also a fire inspector on the scene, Williams said. “Once they (the medical staff) became overwhelmed, our inspector called for us,” Williams said. “Once you start doing the impossible (or at least what you thought was impossible), you can conquer the other fires of your life with ease,” the website says. There are those who succeeded in San Jose, the Mercury News reported. Yet, others crossed the coals unscathed at first, but then dipped their feet in a nearby fountain after blisters started to appear. Some people went to their hotel rooms and called 9-1-1. I just hope that this does not turn people away from giving this a try. I have never personally tried this but I can imagine how powerful you must feel after you have accomplished something like this. Keep in mind that there were over 6000 people there. 21 out of 6000 aint to bad. Especially considering he has been doing this for over 30 years. 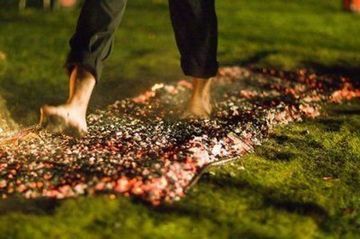 Has any of you ever tried the firewalk experience with Anthony Robbins? Do you think this will hurt Tony’s reputation at all or will he bounce right back after something like this? Yep. I’ve done Tony Robbins ‘Unleash the Power Within’ event three times now, and done firewalking about a dozen times in total. Never been hurt in the process. Quite honestly I was in such an awesome place the first time I felt I couldn’t just walk on fire, i could have walked on water!